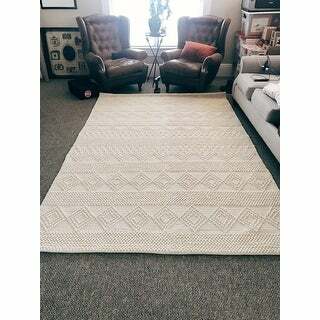 Very nice rug for the price. The pile height is nice, and the material is really soft. The rug I received did not have a chemical smell at all, unlike what was mentioned in other reviews. Glad I took a chance on this one! The rug was stunning; however, it had an extremely strong musty, dank odor. On the advice of Customer Service I returned it and requested a replacement. Unfortunately, the second when the second rug arrived, the odor permeated the outer wrapping and I did not bother to open it. I returned it and requested a refund.